We have the main lodge and cabins along with several yurts where we house and feed our guests. Generally, we supply the main meals at our main lodge. Should you want to stay up on the mountain hunting or fishing and don’t want to hurry back for lunch, no problem. You will find snacks and sandwich items available for you to take before heading out for your day. 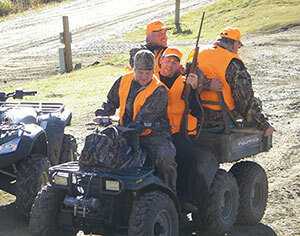 We hunt between 7,500′ and 9,300′ elevation. Should you encounter less than favorable weather conditions, you will find stands and blinds strategically located for your use. Our guide ratio is one guide to every 2 to 3 hunters. Guides are familiar with the area, and will place you where the elk move through daily. Northwest Colorado has one of the largest migratory elk herds in North America, so we have the opportunity to capture this migration in the fall. At the ranch you will find six wheelers on tracks, a jeep, 4 wheelers, and regular 4 wheel drive vehicles to transport hunters to the hunting areas, as well as to retrieve the game. The ranch is complete with a new cooler and skinning room, where you can skin, quarter and hang your trophy animal until ready for processing or transporting the next day. If you are interested in booking an Archery or Muzzle Loader hunt on Brush Mountain, please contact the lodge and we will help you put together an exciting early autumn hunt. Tips for Archery Hunters: On the ranch, your average shot is between 25 and 30 yards, so we suggest you become proficient for shots at those distances. We also encourage all hunters to prepare physically for work at high altitudes (between 7,000 and 9,500 feet). The rifle hunt on Brush Mountain is an exhilarating experience. Check out our Photo Gallery to see some of the animals harvested in past seasons. 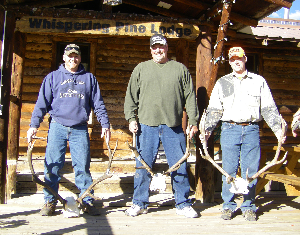 During hunting season, the elk are active and the weather can be brisk. Our hunts average a 90-95% success rate overall. You will want to make your reservation early to secure your spot for the upcoming season. Call us today! Brush Mountain Outfitters believes in fair chase ethical hunts, and the better prepared you are the more you will enjoy your hunt. Please read the DOW rules and regulations at www.wildlife.state.co.us. Licenses can purchased online prior to the start of the season, or over the counter upon your arrival in Colorado. The first and fourth season are draw only; with the second and third season you are able to purchase a license over the counter. Deer tags can be purchased two ways – one through the second and third seasons by draw only, and the other is through Brush Mountain Outfitters, but they have to be reserved ahead of time since they have limited availability. Deer hunting is only allowed in the second and third season. Two important issues are you have to have a total of 500 square inches of hunter orange on your head, chest, and back (camoflage orange is unexceptable), and if you were born after January 1, 1949, you must have a hunter safety card. Note: State of Colorado kill tag is not included in our hunt fees. Purchase is the hunter’s responsibility. ©2015 Brush Mountain Ranch - All Rights Reserved.